Reducing child mortality rates is one of the eight Millennium Development Goals (MDGs). Ahead of an upcoming special General Assembly event next month on efforts by United Nations Member States to meet the Millennium Development Goals (MDGs) and to define a new universal development agenda, Secretary-General Ban Ki-moon has released a report, A Life of Dignity for All, containing his updates on the Goals and vision for the road ahead. “The world’s quest for dignity, peace, prosperity, justice, sustainability and an end to poverty has reached an unprecedented moment of urgency,” he says. He urges the international community to take “every step possible” to achieve the MDGs by the target date of 2015. The new report was released on 14 August to Government delegates ahead of the 25 September General Assembly Special Event on the MDGs and post-2015 development agenda, during a week of several high-level events that will be under way next month at UN Headquarters in New York. As 2015 approaches, the UN, Governments, civil society representatives and others have been engaged in an extensive process to meet a range of growing international challenges. The new report takes stock of the progress that has been made and of the steps that are needed to go forward. With less than 1,000 days to the 2015 target date, bold action is needed in many areas. One in eight people worldwide remain hungry. Too many women die in childbirth when we have the means to save them. More than 2.5 billion people lack adequate sanitation. Inequalities between and within countries persist. Our resource base is in serious decline, with continuing losses of forests, species and fish stocks, in a world with the growing impact of climate change. In the report, the UN chief also outlines his vision for a new and responsive sustainable development framework to meet the needs of both people and planet. Secretary-General Ban calls for a new, broader set of targets beyond 2015 which reflects new global realities and challenges. The goals should be measurable, adaptable to both global and local settings and apply to all countries. He also points to the importance of rule of law and well-functioning institutions. Sustainable development – providing economic transformation and opportunity to lift people out of poverty, advancing social justice and protecting the environment – should lie at the heart of the next steps, backed by enhanced accountability and a sense of shared responsibilities. Contributing to the report were the views of more than a million people who were asked about their main concerns through a series of worldwide consultations in an effort unprecedented for the UN. In June, the Secretary-General also received inputs through reports from his High-level Panel on the Post-2015 Development Agenda, the United Nations Global Compact, the United Nations Regional Commissions, the Sustainable Development Solutions Network and other civil society stakeholders. 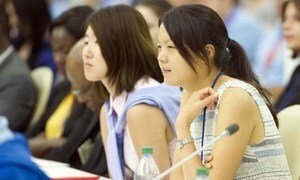 Hundreds of young people from across the world have gathered at United Nations Headquarters in New York to seek ways to strengthen youth leadership and accelerate the achievement of the anti-poverty targets known as the Millennium Development Goals (MDGs).